:Ruth Henderson has moved back in with her parents ? something she swore she would never do, especially not at the age of thirty-three. But in the face of the mountain of debt left by her late-partner and the fact that her teenage daughter, Maggie, is expressing her grief through acts of delinquency, there was really only one option. Returning to a house Ruth swore never to set foot in again is bad enough. Add to this an estranged father, whirlwind mother, and David ? the boy next door who broke her heart ? and it is little wonder Ruth can barely make it out of bed. But then, reunited with her old friend Lois, Ruth is persuaded to go along to a monthly girls? night. Here she meets a bunch of incredible women and for the first time since leaving home at eighteen, Ruth begins to make some genuine friends. She also has her first ever date ? with the charming Dr Carl Barker. However, after a disastrous dinner, and a fraught Maggie still struggling with her father's death, Ruth promises her daughter she won?t go out with any other men. A promise she quickly regrets when David, the boy next door, asks her to dance? About "I Hope You Dance"
Beth Moran has a background as a research scientist and adult educator. She is now part of the national leadership team of the women's network Free Range Chicks. She is married with three children and lives in Calverton, Nottingham. Customer Reviews For "I Hope You Dance"
Ruth Henderson has failed in life. Despite her low opinion of herself, Ruth is clever-a maths prodigy who grew up in a family of champion ballroom dancers, and who never felt accepted by anyone. So I Hope You Dance is the story of Ruth finding love and acceptance from family, from friends, and from herself. I Hope You Dance is written in first person point of view, so we spend the whole novel inside Ruth's head, which gives it more of a YA or British Chick-Lit feel rather than the traditional Christian romance some readers might be expecting. The Britishness also comes through in the Christian elements-lightweight and more told through the subtext than in-your-face preachy (an unfortunate tendency of some US Christian novels). It's definitely more women's fiction than romance, as the focus of the novel is on Beth's personal growth (in an understated British way) than on the romance. Although there is a little romance . . . although that goes very wrong before it goes right, and adds an unexpected element of suspense to the novel. 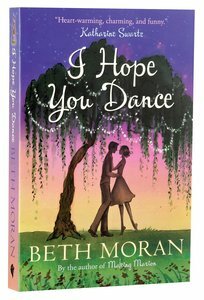 I Hope You Dance is Beth Moran's second novel. I thought her first, Making Marion, was excellent and I Hope You Dance is at least as good. Possibly better. Recommended. Thanks to Lion Fiction and NetGalley for providing a free ebook for review.